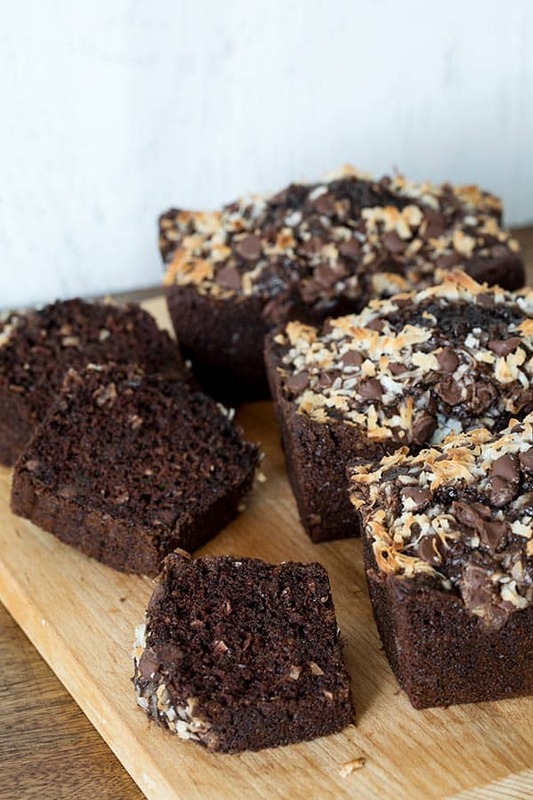 This Coconut Chocolate Zucchini Bread is so rich, moist and delicious no one will ever know that the secret ingredient is zucchini. My husband loves to eat little zucchini from the garden, but he won’t eat the big ones that I wait a bit too long to pick. So I’ve been baking zucchini bread for the last few months. There have been lots of great zucchini recipes posted the past summers and I tried many of them over the years. I was especially attracted to the recipes that didn’t use as much oil. Maria from Two Peas and Their Pod posted a delicious, healthy zucchini bread with cranberries, whole wheat flour and applesauce to replace some of the oil. I love her version too. I loved it so much in fact that I made five different versions of it. Her original Chocolate Chocolate Chip with cinnamon topping, Chocolate Chocolate Chip without cinnamon (my kids favorite), her Spiced Zucchini Bread with a hint of orange, Orange Cherry Zucchini Bread with orange oil and cardamom, and my favorite version, inspired by Hilda’s guest post on Jamie’s blog Life’s a Feast, this Coconut Chocolate Zucchini Bread. The water content in the zucchini you grow in your own garden can vary a lot. Especially if you have a few rainy days. One trick I like to use when I’m making zucchini bread is to spin the grated zucchini in a salad spinner. It removes the excess water from the zucchini so you get consistent results every time. Even if you don’t have a garden overflowing with zucchini, it’s inexpensive to buy at the market. 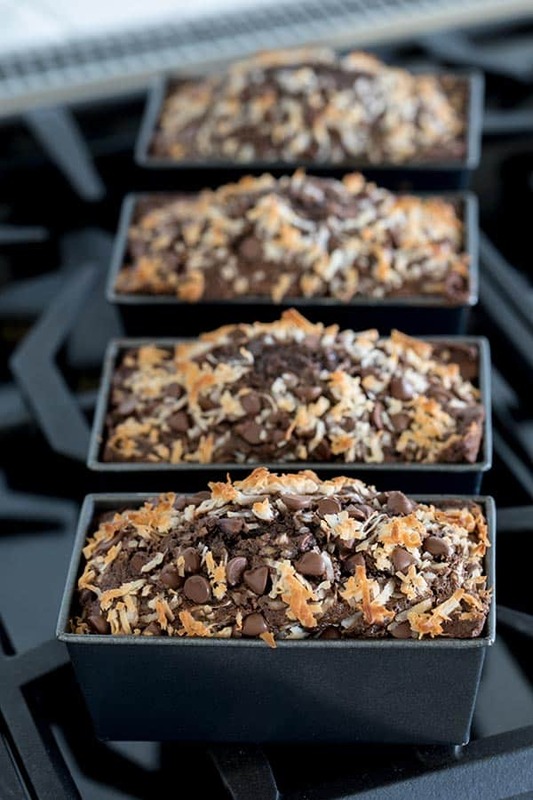 So pick some up and give this Chocolate Chip Coconut Chocolate Zucchini Bread a try! Preheat oven to 350 degrees. Grease and flour 2 loaf pans (or 4 mini loaf pans) and set aside. Combine flour, cocoa powder, baking soda, and salt in a bowl and whisk to combine. Set aside. In a large mixing bowl, whisk together sugar, oil, brown sugar, eggs, and vanilla until blended. Add sour cream and whisk to combine. Add dry ingredients and mix just until blended. 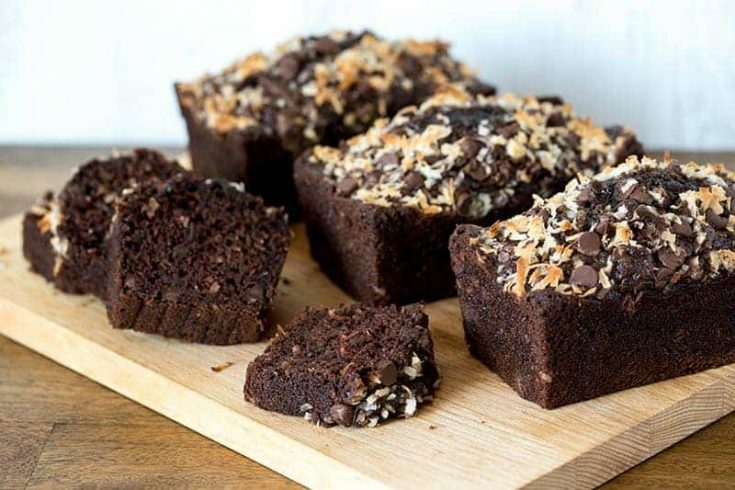 Stir in zucchini, chocolate chips, and coconut. Divide batter between pans. Sprinkle coconut and chocolate chips on top of batter in pans. What scrumptious loaves! All those extra goodies make this one irresistible zucchini bread! My zucchini plant died, but I have patti pan squash coming out my ears. Do you think I could use that instead? It tastes similar to me – mild squash flavor. When I saute it in a pan, it seems just about as watery as zucchini. I’d appreciate your thoughts about the swap. The zucchini adds moisture and density without extra oil. This is beautiful. What a great way to use too big zucchini from the garden. Thanks for sharing! How did you know I have zucchini busting out of my garden, Barbara? 😉 It’s coming in fast and furious…if my arm was long enough to reach you, I’d be more than happy to share! They’ve been keeping me busy in the kitchen trying new zucchini bread flavors. I know we’d love this one-those loaves look wonderful. 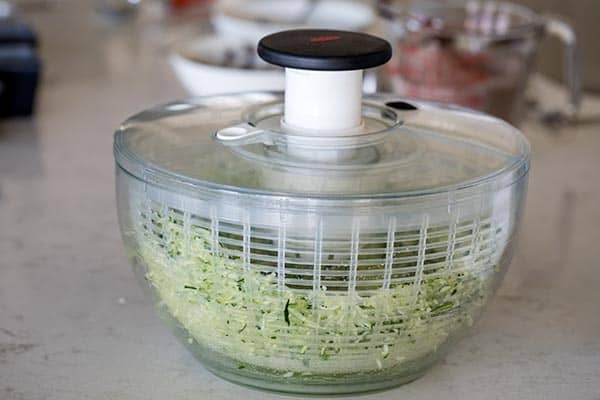 Great idea using the salad spinner to get the excess water out too-I sometimes grab my potato ricer to give the shredded zucchini a gentle squeeze. The potato ricer is a great idea too. Thanks Carol! Hi Barbara – some are used on top and some are stirred in to the batter before putting in the pan. I’ve updated the recipe. Thanks for the heads up. This bread is awesome! I make it anytime I have extra zucchini! THanks for sharing!!! Hi Helena – so glad you enjoy the recipe. Thanks for letting me know. Sounds so good! I’ve never tried to actually make zucchini bread (even thought I love it), I think I’ll give this recipe a shot :)! I was baking yesterday and my husband requested something with coconut. I already had a cookie recipe I was going to try so put the coconut on the back burner. I am going to try this soon as it looks great! I gotta try that chocolate coconut version. They are so pretty sitting there in their pans! Awesome recipe!!! Made this twice on the wnekeed, and every time it was a huge hit. Very simple to make, and the kids loved it even though it was loaded with Zucchini and all good things!I used the large chocolate chip since that’s all i had on hand, but it still tasted great! Now that's my kind of bread. I will be making this soon. Your loaves are picture perfect!